Having led the International Renewable Energy Agency over the past eight years with a privileged-insider view of the energy transition, I have become convinced that a new geopolitical reality is taking shape. The result will be a map of energy geopolitics that will look fundamentally different from the one that has dominated the past 100 years. Whereas coal powered industrialization in the 19th century and oil drove nations’ making of alliances in the 20th, a quiet revolution of renewables will transform the politics of the 21st century. The untold story of renewables is that they’re transforming the global energy system at a speed no one predicted. In recent years, technological advances and falling costs have made renewables genuinely competitive commercially. Price trends suggest that by 2020, the average cost of electricity generated by solar and wind sources will be at the lower end of fossil fuel prices. The other critical factors in this quiet revolution have been agreement on the imperative to counter climate change, leading to ambitious renewable energy targets; action by investors; and global public opinion, which increasingly supports renewables. At present, around 80 percent of the world’s people live in countries that are net energy importers. In the future, energy production will be dispersed. Renewable sources, such as hydropower, bioenergy, solar, geothermal and wind, are available in some form in most countries. Whereas the location of fossil fuel stocks was random and unequal, access to renewable energy will be far more evenly spread. Nimble players have already seized the opportunity to not only secure their own future energy supplies but also to become new energy leaders. 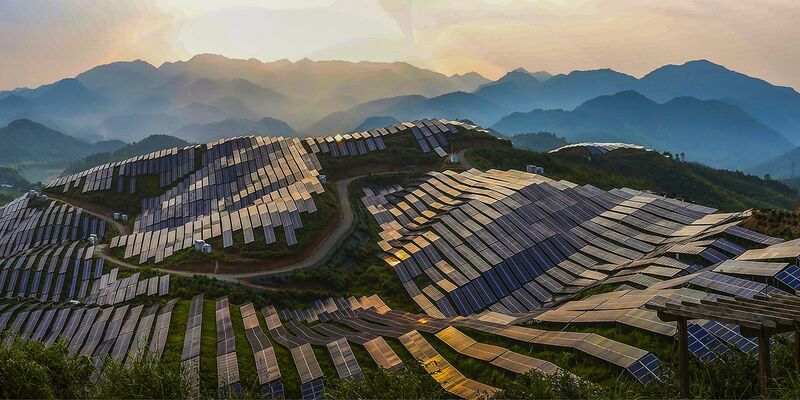 China has put itself in pole position to be the world’s renewable energy superpower. It is the world’s largest producer, exporter and installer of solar panels, wind turbines and electric vehicles, and it accounted for over 45 percent of global investment in renewable energy in 2017. In Europe, Germany generated 40 percent of its electricity through renewable sources in 2018. Of course, shifts in energy production will not single-handedly upend international relations. But “energy statecraft” will no longer have the same potency. In years to come, fossil fuel exporters will see a decline in their global reach and influence unless they can reinvent their economies for the New Energy Age. Over the past 50 years, some countries have used their position as one of the world’s largest oil and gas exporters to exert political leverage in their near neighborhood and beyond. Energy choke points, such as the Strait of Hormuz leading out of the Persian Gulf, have been vulnerable to militant violence, piracy and bilateral flare-ups. As recently as November 2018, the U.S. has flexed its muscles over the global oil supply with sanctions on Iran, albeit with limited short-term success. The global leaders in the New Energy Age may surprise us. Diverse countries have already made impressive transitions. Countries such as Denmark generate more than half their electricity from renewables. Costa Rica’s electricity was generated entirely from renewables for 300 days in 2017. The power systems of Germany and Portugal ran entirely on renewables for several days last year. New geographies of energy trade could also emerge. Shipping routes will become less important; those countries with the best connectivity, networks and “grid infrastructure” (power lines, storage facilities and virtual interconnections) will hold the strategic advantage in controlling energy supply routes. China’s Belt and Road Initiative, which seeks to connect Asia, Africa and Europe through infrastructure, is significant in this regard. Countries may also seek to integrate their grids with those of neighboring countries, such as in the proposed Asia Super Grid. the world’s cobalt supply originates in the Democratic Republic of Congo, for example. Still, the benefits of the New Energy Age will outweigh the challenges. With the demise of energy statecraft, the contours of foreign policy will shift and the global distribution of power will change. Policymakers need to act now to seize the opportunity of renewables and anticipate the challenges that the future holds. The New Energy Age will help shape a very different world, and every country has the potential to benefit. general of the International Renewable Energy Agency.